A look at the role of OCT and the relationship between the depth of the lamina cribrosa, the stage of glaucoma, and the extent of vision loss. Ophthalmology is one of the few specialties in which diagnostic imaging provides detailed information about the tissue in question and plays a crucial role in the identification and treatment of disease. 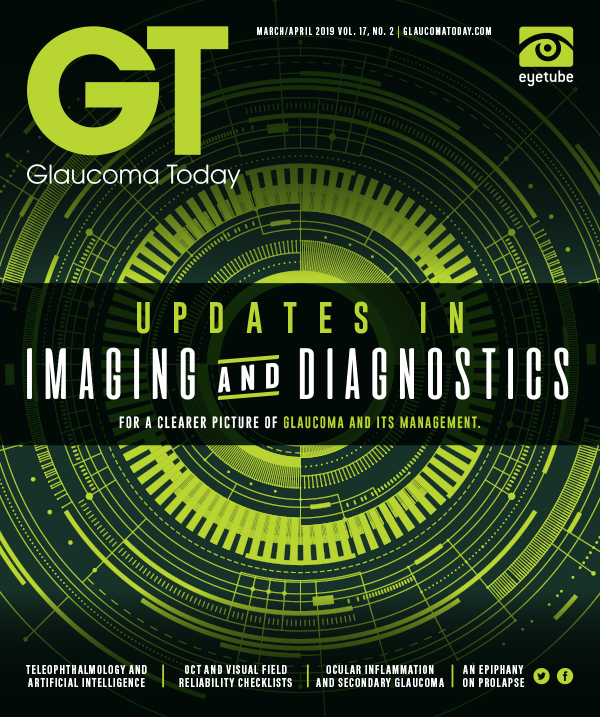 In the era before diagnostic imaging modalities such as OCT, physicians relied on key clinical features of the optic nerve head (ONH) and lamina cribrosa (LC) to identify the presence and extent of glaucoma. • As imaging modalities and their software advance, ophthalmologists may be able to use the changes to the optic nerve head and lamina cribrosa to yield clinically relevant information. • Future imaging will likely entail the development of software algorithms to show change in the anterior laminar cribrosa depth and the measurement of strain behind the lamina cribrosa. Figure 1. A deeply excavated optic nerve with evidence of laminar dots and scleral beams. 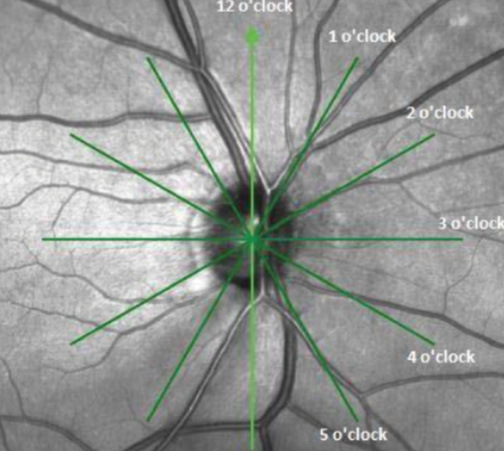 Features such as excavation or backward bowing of the LC, presence of laminar dots, and an increased vertical cup-to-disc ratio offered insights into the extent of retinal nerve fiber layer (RNFL) thinning and scleral exposure seen at the level of the LC (Figure 1).1 Although these clinical features continue to be important in the assessment of the stage and progression of glaucoma, they can be subjective and do not provide as much fine detail as OCT. In a paper by Park et al,4 the ALD of normal eyes was compared with eyes that had different stages of treated glaucoma. The investigators measured the ALD in each eye by averaging 11 equally spaced horizontal B-scans across the ONH, which allowed them to calculate the depth of the LC. They found that posterior LC displacement occurred mostly in eyes with preperimetric and mild to moderate glaucoma. No significant difference was seen in eyes with moderate to severe glaucoma. This finding suggests more fluidity and movement within the sclera early in the disease that may be lost in advanced stages. Moreover, Quigley et al6 suggested that eyes with more advanced glaucomatous damage also exhibited a smaller response to changes in ALD with IOP fluctuations. In their study, 28 patients were imaged before and after IOP lowering, and ALD was measured with six radial scans before and after the change in IOP (Figure 3). The investigators found that the anterior LC can move anteriorly or posteriorly with IOP reduction and that there was less displacement of the LC with more advanced glaucomatous damage. 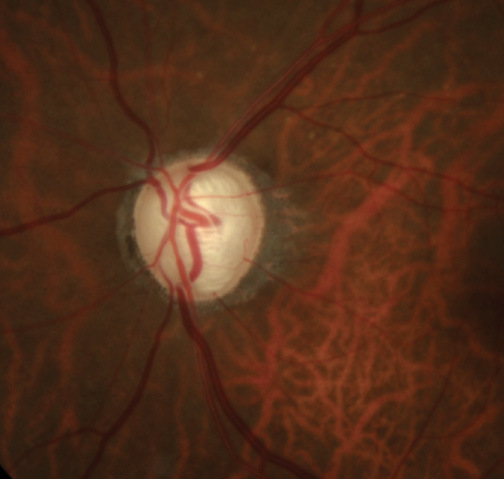 In addition to the overall gross changes in LC examined in these studies, the focal defects or optic pits found on clinical examination were correlated with defects or laminar holes on the LC found on enhanced-depth imaging OCT.7 The presence of these defects on OCT can be signs of weakening of the LC and possible optic nerve damage. If seen early, they may be good indicators for starting or advancing treatment. Nonetheless, as imaging modalities and their associated software advance, ophthalmologists may be able to use the changes to the ONH and LC to yield clinically relevant information about the stage of glaucoma, the stiffness of the sclera, and the potential response to therapy. Future imaging will likely entail the development of software algorithms to show change in the ALD and the measurement of strain behind the LC. 1. Quigley HA, Hohman RM, Addicks EM, Massof RS, Green WR. Morphologic changes in the lamina cribrosa correlated with neural loss in open-angle glaucoma. Am J Ophthalmol. 1983;95:673-691. 2. Rhodes LA, Huisingh C, Johnstone J, et al. Variation of laminar depth in normal eyes with age and race. Invest Ophthalmol Vis Sci. 2014;55:8123-8133. 3. Ren R, Yang H, Gardiner SK, et al. Anterior lamina cribrosa surface depth, age, and visual field sensitivity in the Portland Progression Project. Invest Ophthalmol Vis Sci. 2014;55:1531-1539. 4. Park SC, Brumm J, Furlanetto RL, et al. Lamina cribrosa depth in different stages of glaucoma. Invest Ophthalmol Vis Sci. 2015;56:2059-2064. 5. Lee EJ, Kim TW, Weinreb RN, Kim H. Reversal of lamina cribrosa displacement after intraocular pressure reduction in open-angle glaucoma. Ophthalmology. 2013;120:553-559. 6. Quigley H, Arora K, Idrees S, et al. Biomechanical responses of lamina cribrosa to intraocular pressure change assessed by optical coherence tomography in glaucoma eyes. Invest Ophthalmol Vis Sci. 2017;58:3029. 7. You JY, Park SC, Su D, Teng CC, Liebmann JM, Ritch R. Focal lamina cribrosa defects associated with glaucomatous rim thinning and acquired pits. JAMA Ophthalmol. 2013;131(3):314-320. 8. Leung C. Optical coherence tomography imaging for glaucoma – today and tomorrow. Asia Pac J Ophthalmol. 2016;5:11-16.